Ireland is known for its beautiful landscapes, rich history and culture, and friendly people. Ireland is an island country in north-western Europe. The modern sovereign state occupies about five-sixths of the island of Ireland, which was partitioned on 3 May 1921. It is a parliamentary democracy and a republic. Ireland a dynamic, lively, modern country with a young population and a successful, technologically orientated economy.... but it remains a country where music, conversation, culture, traditions, time to relax, listen and make friends ... matter, A country with cultured, cosmopolitan cities renowned for its beautiful, unspoiled countryside and scenery. Ireland is the successor-state to the Dominion called the Irish Free State. That Dominion came into being when all of the island of Ireland seceded from the United Kingdom of Great Britain and Ireland on 6 December 1922. However, the following day the Parliament of Northern Ireland exercised its right under the Anglo-Irish Treaty to opt back into the United Kingdom. This action followed four attempts to introduce devolved autonomous government over the whole island of Ireland (in 1886, 1893, 1914 and 1920) and the Partition of Ireland. The Irish Free State was abolished when Ireland was formally established on 29 December 1937, the day the Constitution of Ireland came into force. Irish independence from Britain in 1922 was preceded by the War of Independence and the Easter Rising of 1916, when Irish volunteers and the Irish Citizen Army took over sites in Dublin and Galway under terms expressed in the Proclamation of the Irish Republic. The state of Ireland consists of twenty-six traditional counties which are still used in cultural and sporting contexts, and for postal purposes. These are, however, no longer always coterminous with administrative divisions. Several traditional counties have been restructured into new administrative divisions. County Dublin was divided into three separate administrative counties in the 1990s and County Tipperary was divided into two in the 1890s. This gives a present-day total of twenty-nine administrative counties and five cities. The five cities — Dublin, Cork, Limerick, Galway, and Waterford — are administered separately from the remainder of their respective counties. Five boroughs — Clonmel, Drogheda, Kilkenny, Sligo and Wexford — have a level of autonomy within the county. While Kilkenny is a borough, it is has retained the legal right to be referred to as a city. 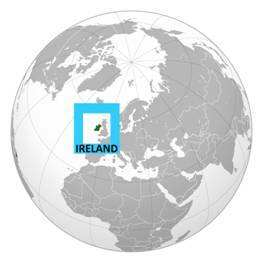 The island of Ireland extends over 84,421 Square kilometres (32,556 square miles), of which 83% (approx. five-sixths) belong to the Irish state (70,280 km²; 27,103 sq mi), while the remainder constitute Northern Ireland. It is bounded to the north and west by the Atlantic Ocean, to the northeast by the North Channel. To the east is found the Irish Sea which reconnects to the ocean via the southwest with St George's Channel and the Celtic Sea. The west coast of Ireland mostly consists of cliffs, hills and low mountains (the highest point being Carrauntoohil at 1,038 m or 3,406 ft). The coastline has been remarked to look like a teddy bear facing west. The interior of the country is relatively flat land, traversed by rivers such as the River Shannon and several large lakes or loughs. The centre of the country is part of the River Shannon watershed, containing large areas of bogland, used for peat extraction and production. Ireland also has off-shore deposits of oil and gas. Ireland has a rich heritage and the influence of its culture has been felt the world over, probably more than any other, from music, art, myths, language, food and literature. For a very long time, with no newspapers, radio or TV, news and events were put to music and relayed by the Bards that traveled the land. A Bard was always welcome, as his music and poetry was entertaining as well as bringing news of what was happening throughout the countryside.